Ruby, Laura. Bone Gap. HarperCollins Children’s Books: New York, NY. 2015. ISBN 978-0-06-231760-5. A young girl named Roza goes missing. However, the people of Bone Gap aren’t concerned. It’s not the first time, and they assume it won’t be the last. However, Finn O’Sullivan knows that she’s not just missing, but rather, was kidnapped. But no one believes him. 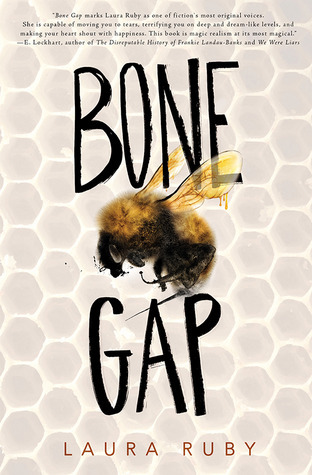 Characters: Bone Gap is very much driven by its characters. Our main character, Finn, defy stereotypes. He’s the prettiest boy in the town, but people think he’s strange. They call him names. An outcast, despite being beautiful, Finn sees people. He really sees them. He doesn’t base anything off of looks, as he knows looks can be deceiving. He’s in love with Petey, which no one believes, because why would someone so pretty love someone so ugly. I love that he truly does see others. He’s in love with Petey for who she is, not how she looks. We see her characterization defying stereotypes with Roza as well. She’s beautiful. Stunning, really. The kind of beautiful that makes her the center of sometimes unwanted attention. But she’s headstrong and can take care of herself. The only time we really see some stereotypes are with Petey. She’s not pretty. Her self worth has been mutilated by harsh words of others. She can’t see how Finn loves her. What she doesn’t understand is that it is her intelligence and independent spirit that Finn loves. And even though it’s a bit of a stereotype, it’s not cliched at all. I think the author did a marvelous job writing her her characters. They are all very well rounded and are a refreshing break from the constant stereotyping we see in young adult books. Setting: Bone Gap is a town that is very mystical. The novel has a touch of magical realism to it, so you don’t really know where you are, but you know that there is something different about it. I thought she did a good job making this place mysterious and somewhat unsettling. It keeps you on the edge and keeps you from getting too comfortable. Plot: It is very strange. It’s actually really really strange and I wasn’t entirely sure I would like it. It makes you question reality. You don’t always know everything, or anything. But the mystery keeps you going. You want to know what’s going on, why it’s going on, and how it will all end, so it keeps you hooked. But it’s still weird and can be for some people, a turn off. Theme: The biggest theme, and the main point of the novel is that we don’t see. We look, but we don’t see what’s beneath the surface, and that is very much true. How often do we judge people based on looks. On their clothes, their appearance, their houses, their cars, etc. How often do we judge situations without seeing the big picture? Always. This book is very much about slowing down and analyzing situations in a way you never have before. It’s about seeing people for who they are, not how they look. It’s a message our children desperately need to learn. Style: Poetic language that flows beautifully is what really captivates an audience, and the author did just that. I loved how it was written and how it kept me pulled in every second I was reading. I wasn’t jerked in and out of the book, which, for the type of book it is, is rare.